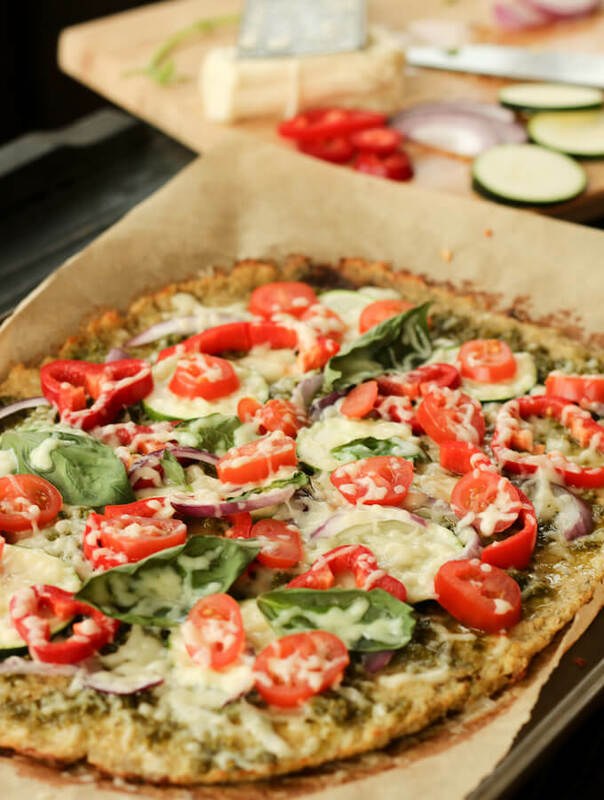 As soon as I had made the cauliflower bread, I knew that the cauliflower pizza crust wasn’t far away! And rightly so, here comes the low calorie, healthy, and delicious cauliflower pizza base with plenty of vegetarian toppings! The cauliflower pizza “dough” is more or less the same as cauliflower bread base, except that I add a few extra dried herbs to the dough. If you don’t add any seasoning to the pizza mix, the cauliflower pizza base will taste like baked cauliflower. Not my favorite taste. Apart from salt and pepper, I added dried oregano and dried basil. You can also add some crushed fresh olives to the base! Does cauliflower pizza crust get crispy? Now I have to confess, cauliflower pizza base is not as crusty as a regular pizza base. It is soft but I like its softness. I have seen many recipes claiming for crispiness, but frankly speaking, it does get crisp enough to hold but not as crispy as a regular white flour pizza base. To make it crisp, I spread the mix, fairly thin — just about half a cm. Otherwise, the pizza base will become soggy. 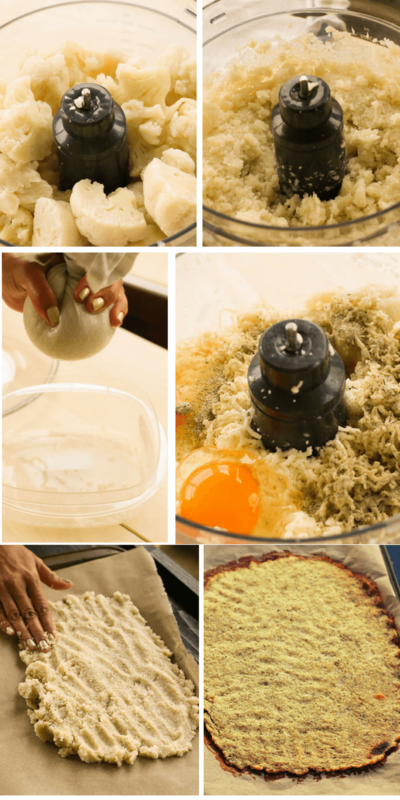 Here are a few process shots to show the step-by-step recipe for making cauliflower pizza base. For the pizza toppings, I used basil pesto for the base and then added red peppers, red onions, cherry tomatoes, fresh basil, and mozzarella. But I love the fact that the pizza base provides a wonderful opportunity to experiment with the toppings. What toppings do you fancy? Would you like a classic margherita pizza on a cauliflower base? 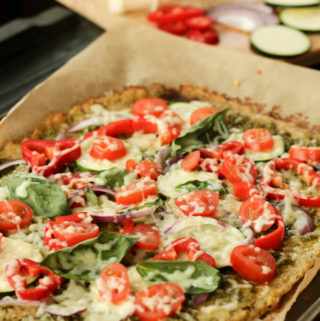 Healthy pizza days are here with this low-cal cauliflower pizza crust recipe. The pizza base is made with cauliflower, eggs, mozzarella and a mix of spices. I’ve made a vegetarian pizza with basil pesto and colorful veggie toppings but go wild with toppings of your choice! Prepare a baking tray by lining with parchment paper and spray a little oil on top. Steam the cauliflower florets for 5 minutes in salt water and let them air dry. Grate in a food processor and then transfer them to a cheesecloth. Wring it hard to get as much water out as possible. Return to the food processor, add mozzarella, break in the egg and add all the pizza base spices. Mix together on low speed for just about 30 seconds. Spread thinly with your fingers on the prepared baking tray. Remove and carefully flip. Bake for another 10 mins. Take out the cauliflower pizza crust from oven. Evenly spread the basil pesto on top. Sprinkle zucchini, red peppers, and red onions. Bake for 5 minutes. Remove from oven. Add the cherry tomatoes, fresh basil, and grated mozzarella. Cut with the pizza cutter and enjoy hot. I also like the cauliflower pizza cold! The cauliflower pizza crust freezes well. For freezing, I would suggest you make smaller rounds up to 8 inches in diameter. Place a piece of baking sheet in between the crusts and freeze in a big freezer bag. 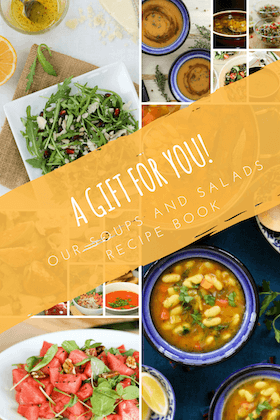 You can also add them to vegetable paellas, fried rice and mixed vegetable recipes. I don’t have egg or fish some of your recipes have eggs. Can you give without eggs. I don’t have any recipe with fish. In this recipe, in place of egg, you can add 2 tbsp chickpea flour or 1 tbsp ground flaxseed mixed with 3 tbsp water.